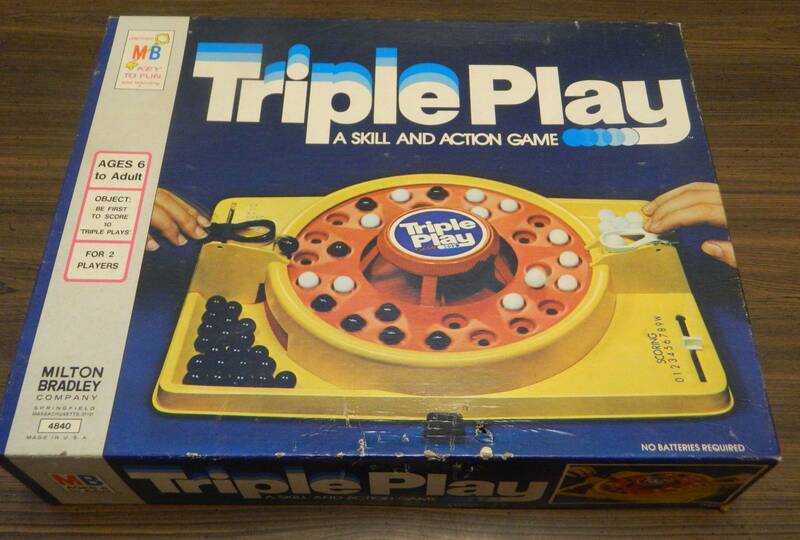 When I first saw Triple Play at a thrift store it looked like a game that I could have some fun with. Basically it looked like a combination of a speed and dexterity game as you tried to shoot marbles onto the gameboard in order to score points. While I didn’t think Triple Play was going to be a fantastic game, I thought it could be pretty good. One concern that I had about the game was that it clearly never caught on as the game was never reprinted. Triple Play is a solid speed game that can be fun in short doses but gets repetitive after a while. Place the gameboard between the two players so one launcher is in front of both players. Each player takes all of the marbles of their color and places them in their storage tray. Each player sets their scoring marker to zero. Push in the stop/start knob. Turn the wheel clockwise as far as it will go. When both players are ready, pull the stop/start knob out which should make the wheel start turning. Both players play at the same time. They load a marble onto their launcher and shoot it at the gameboard. Players can shoot their marbles as quickly as they want. 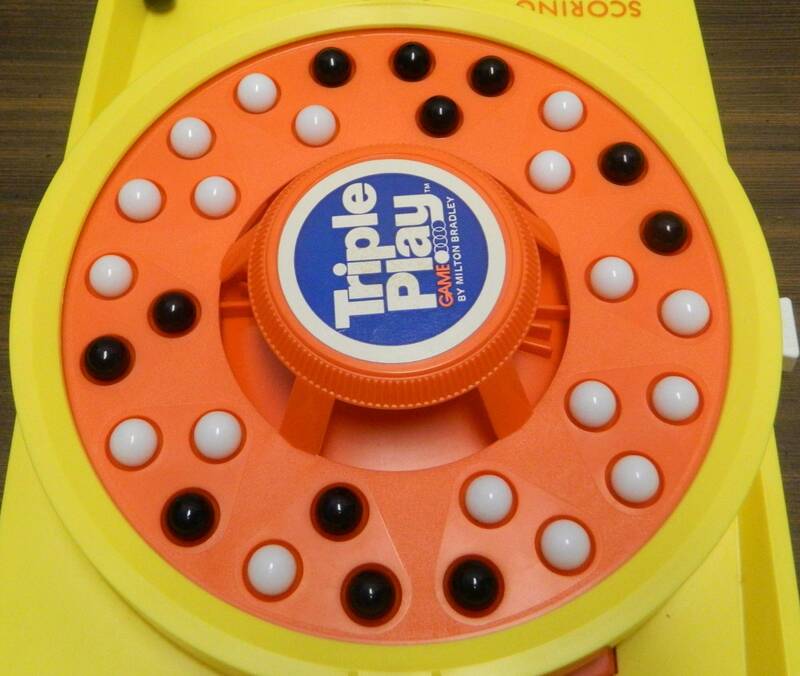 The goal is to get your marbles into three neighboring holes to create a triangle (a Triple Play). You should also shoot marbles to prevent your opponent from completing a triangle. If you shoot a marble and it doesn’t land in one of the holes, one of three things can happen. If the marble stays on the gameboard, it remains there until it is knocked into one of the holes or into the center of the gameboard. If the marble enters the center of the wheel, it should be automatically returned to your tray and you can shoot it again. If the marble ends up in the other player’s tray, it remains there until the end of the round. You need to make sure you don’t shoot one of your opponent’s marbles though. 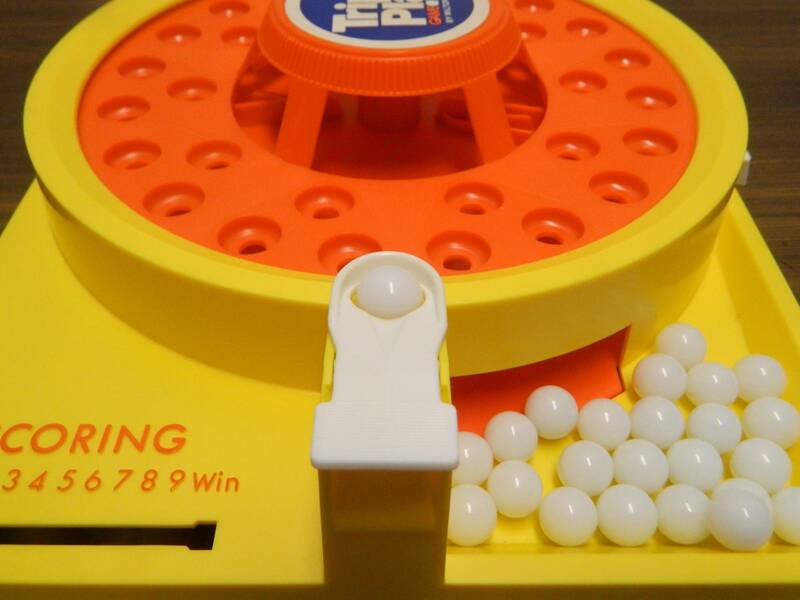 The round ends when either all of the holes are filled with marbles or the gameboard stops turning. At the end of the round the players will figure out how many Triple Plays they formed. The players will move their scoring marker forward one space for each Triple Play they formed. The white player has completed two “triple plays” (top-left and bottom-right) so they will score two points. The black player has completed one triangle (top) so they scored one point. If neither player has scored ten points, another round is played. The gameboard is reset and the players return all of their opponent’s marbles. The first player to score ten points wins the game. 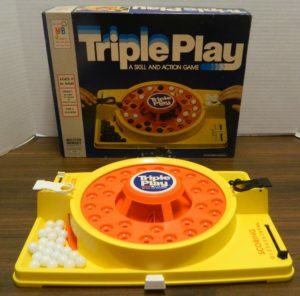 Triple Play is at its core a really simple game. Each player sits on opposite sides of the board with their set of marbles. 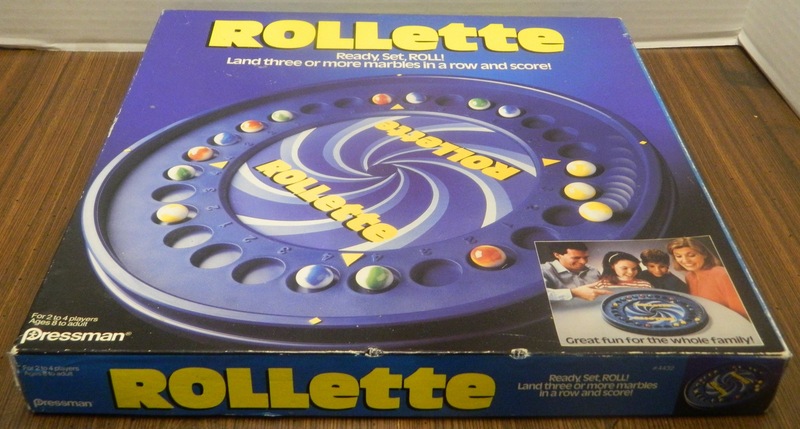 When the timer starts players “launch” (more of a roll) their marbles onto the gameboard. The goal is to fill the triangles on the board with marbles of just your color. As both players play at the same time, players race to get as many of their marbles on the board as they can. For each triangle that a player completes with only their colored marbles, they will score a point. The first player to score ten points wins the game. For the most part I would say that Triple Play is like your typical speed game with a few dexterity mechanics added in. As I will get to shortly, speed is a key component to the game. The faster you can load your launcher and release the marbles, the better odds you have in the game. Players who are bad at speed games are going to have troubles in the game. In addition to the speed mechanics there is some light dexterity as well. Speed is clearly more important but being able to do a good job aiming your marbles will help you in the game. As you are mostly just lifting up a guard that allows the marbles to roll onto the gameboard, most of the aiming in the game comes from timing. You need to release the marbles at the right time so they fall into the hole that you are aiming for. Basically after a round or two, I quickly realized that there is a two step process to doing well in Triple Play. When the round begins you are probably best off launching your marbles as quickly as possible. Instead of focusing on aiming, I put all of my effort into loading the launcher and letting the marbles go as quickly as possible. While you can somewhat aim in the game, it is better to just get as many of your marbles on the board as possible. This is important as it gives you the opportunity to complete more triangles and prevent the other player from scoring. A lot of your shots will miss but you likely will get more marbles on the board than if you took your time and aimed your shots. After the gameboard has fully rotated two or three times, you should move onto a more nuanced approach. At this point there should be at least one marble in pretty much each triangle, so speed is no longer a priority. You need to canvass the board and see which areas you should aim for and which areas you should ignore. Any triangle that has a marble of both colors can be ignored entirely as neither player can ever score a point from it. Instead you should spend your time blocking triangles that your opponent can complete and completing your own triangles. As you won’t have to shoot at all of the triangles, you can spend more time aiming your shots and making each shot count. While I recommend aiming at the end of each round, I am not entirely sure how much aiming you can do in Triple Play. At times it felt like aiming actually mattered and other times it felt like it didn’t matter at all. As I said earlier, most of the aiming in Triple Play relies on timing your shots correctly. Some people are naturally going to be better at the game as they are better at timing when to release their marbles. The more you play the game, the better you get at making shots. I am a little skeptical of aiming though as it is hard to predict how any particular shot is going to work. You could time a shot perfectly and it could still easily roll into the center of the board. It seems kind of random how a marble will move around the board once you release it. It can fall right into a hole or it can roll around before falling into the center. There is no controlling this so there is a limit on how much you can aim in the game. When aiming you are probably best off trying to shoot as many marbles as you can when the hole you are targeting passes by. It shouldn’t come as a surprise that each round of Triple Play is quite short. I would say that most rounds only take 1-3 minutes. As players will generally score between 0-3 points each round, I would say most games ultimately take 10-15 minutes. Unless both players take their time, you can fill the holes up pretty quickly. While the rules say to continue a round until either all of the spaces are filled up or the gameboard stops spinning, you can end most rounds even earlier. Whenever a triangle has a marble of both colors, there is no point of trying to fill in the third space as neither player can score a point from it. Thus you can save some time if you end a round when there are no triangles left that players can actually score. Triple Play is a really simple game but you can have fun with it if you like these type of speed games. I had some fun with Triple Play as it is kind of fun trying to launch marbles as quickly as possible. It is also kind of satisfying being able to finish off a triangle or block the other player from scoring. Unfortunately with the game being so simple and quick, it can get repetitive rather quickly. After a game or two, you are going to become a little bored with it. Triple Play is one of those games that you play for a little while and then put it away for a couple months before you bring it out again. Triple Play’s components are a mixed bag. The gameboard is pretty generic as there is not a whole lot to look at. Mechanically the gameboard is pretty good when it works. You just wind up the gameboard, start the timer and it spins the gameboard on its own. It usually spins the board at a pretty steady pace even though there are occasional times when it sputters a little. This is probably a symptom of a problem with many of these older board games that used a mechanical timer. The timer in a lot of these games wear out and eventually don’t work at all. If you are looking at used copies of Triple Play, make sure you find a copy whose timer/mechanical component still works well. Should You Buy Triple Play? Triple Play is a decent speed game. In the game you try to launch your marbles as quickly as possible in order to fill in triangles with your color. The first half of most rounds rely on you placing a marble in your launcher and then launching them as quickly as possible. After the gameboard fills up there is a higher reliance on aiming. You can’t really “aim” in the game so you are mostly relying on timing your shots so the marbles roll to the section you are aiming for. Like a lot of speed games, you can have some fun with Triple Play. The problem is that the game gets repetitive pretty quickly. This makes Triple Play one of those games that you play for a short time and then put it away for another day. If you don’t generally like speed games or want a game with a little more to it, Triple Play is not going to be for you. If you are looking for a quick simple little speed game, you can have some fun with Triple Play. As you likely will only want to play the game for short periods at a time, I would probably only recommend picking up the game if you can get a good deal on it. An occasionally fun speed game. The components tend to wear out over time making it hard to find a used copy that still works well.